Dr. Eugenie Brunner explains how laser facials can be customized to treat a diverse range of skin types and concerns without the downtime associated with surgery. 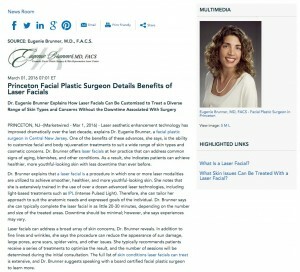 Princeton, NJ — Laser aesthetic enhancement technology has improved dramatically over the last decade, explains Dr. Eugenie Brunner, a facial plastic surgeon in Central New Jersey. One of the benefits of these advances, she says, is the ability to customize facial and body rejuvenation treatments to suit a wide range of skin types and cosmetic concerns. Dr. Brunner offers laser facials at her practice that can address common signs of aging, blemishes, and other conditions. As a result, she indicates patients can achieve healthier, more youthful-looking skin with less downtime than ever before. Dr. Brunner explains that a laser facial is a procedure in which one or more laser modalities are utilized to achieve smoother, healthier, and more youthful-looking skin. She notes that she is extensively trained in the use of over a dozen advanced laser technologies, including light-based treatments such as IPL (Intense Pulsed Light). Therefore, she can tailor her approach to suit the anatomic needs and expressed goals of the individual. Dr. Brunner says she can typically complete the laser facial in as little 20-30 minutes, depending on the number and size of the treated areas. Downtime should be minimal; however, she says experiences may vary. Laser facials can address a broad array of skin concerns, Dr. Brunner reveals. In addition to fine lines and wrinkles, she says the procedure can reduce the appearance of sun damage, large pores, acne scars, spider veins, and other issues. She typically recommends patients receive a series of treatments to optimize the result, and the number of sessions will be determined during the initial consultation. The full list of skin conditions laser facials can treat is extensive, and Dr. Brunner suggests speaking with a board certified facial plastic surgeon to learn more. Dr. Eugenie Brunner is double board certified in facial plastic and reconstructive surgery and otolaryngology (head and neck surgery). In addition to her Central New Jersey-area practice, she is also the director of the Skin Rejuvenation Laser Center, dedicated to non-surgical cosmetic enhancement. A graduate of Rutgers College and Robert Wood Johnson Medical School – The University of Medicine and Dentistry of New Jersey, Dr. Brunner has also completed fellowship training in Advanced Cosmetic Facial Plastic Surgery at the University of Toronto. She is the recipient of numerous awards, and she is an active member of the American Society for Laser Medicine & Surgery. Dr. Brunner is available for interview upon request.